Nestled partway up a mountain in northeastern Kyoto, Tanukidani-san Fudō-in Temple can trace its history all the way back to the Heian period, existing as a cave with a statue for centuries until the actual temple complex was built in its present form until 1944. 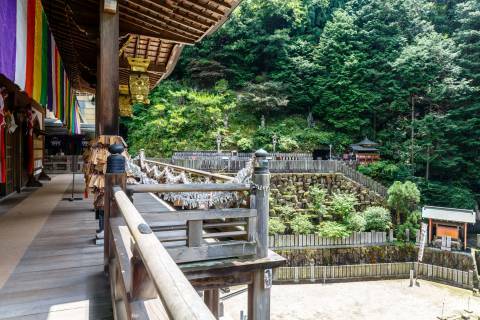 It is said that the famous swordsman Miyamoto Musashi came to this area to hone his skills and undergo ascetic training in the 1600s, and visitors can see the waterfall at which this illustrious rōnin trained even today. Tanukidani-san Fudō-in is a temple that eschews the more traditional Buddhist sect system in favor of the ascetic nature worship of Shugendō. A practice that combines various Buddhist, Shinto, and Taoist beliefs, Shugendō can be translated as "the way to spiritual power through discipline", and the monks who follow this tradition undergo strict ascetic training. 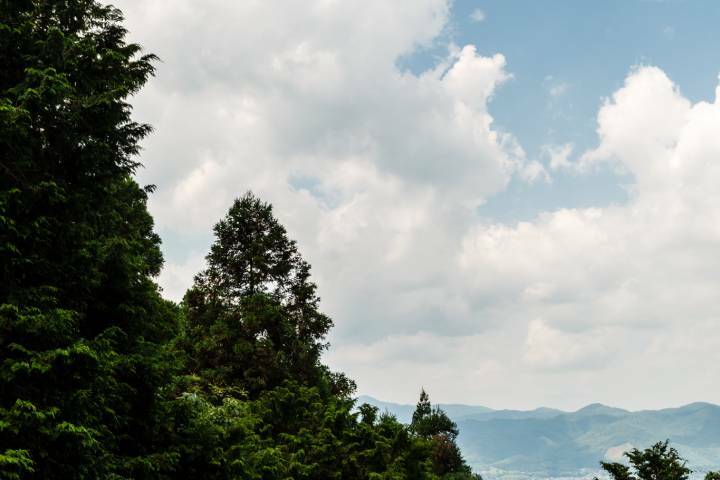 Also known as a place to pray for recovery from illness as well as famous for its many tanuki statues, make the climb up to Tanukidani-san Fudō-in and a look out over the rich mountain peaks yourself! Tanukidani-san Fudō-in is a temple that eschews the more traditional Buddhist sect system in favor of the ascetic nature worship of Shugendō. The first thing you’ll notice about Tanukidani-san Fudō-in is that sprawled over the grounds from the first entrance up into the temple courtyard are many tanuki statues. Tanuki, or “raccoon dogs”, are a real animal in Japan, but in the past they were considered to be supernatural creatures that could change their shape or possess humans to make them look foolish or play tricks. Because of their… natural blessings, tanuki are often depicted in art and statuary with oversized scrotums, so don’t be shocked when you see your first statue! Mt. Tanukidani means “Mt. Racoon Dog Valley”, and the name is certainly true with all the tanuki statues scattered about. Some are quite interesting and humorous, such as a husband and wife tanuki, a tanuki holding an abacus, and a mountain monk tanuki. 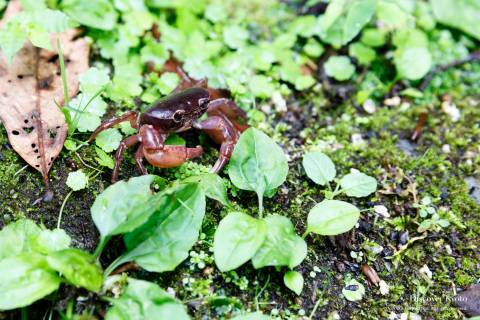 Enjoy a good tanuki scavenger hunt while you’re at Tanukidani-san Fudō-in! You may know Kiyomizu-dera in southern Higashiyama, a temple that is famous for its butai (stage) that juts out over maple trees and offers a great view of Kyoto City. But did you know that Kiyomizu-dera isn’t the only temple in Kyoto with a great butai? Tanukidani-san Fudō-in has a “stage” attached to its main hall from which you can see the northern part of Kyoto spread out beneath you without dealing with the crowds you might encounter elsewhere. It also offers a commanding view of the temple courtyard, making it a great place from which to watch the temple’s fire rituals. The principal object of worship at Tanukidani-san Fudō-in is known for miraculously curing the sick, and many people come to this temple to pray for recovery from serious illnesses such as cancer. 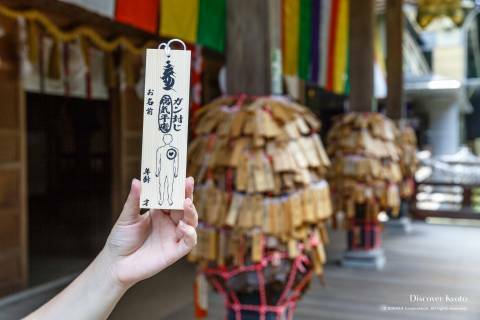 One way people give their prayers form is with gankake fuda, special votive tablets available for people to write and hang up on the columns of the temple’s main hall. A human silhouette is drawn on the charm, and parishioners circle what part of the body they are having trouble with, such as the heart for heart failure, lungs for lung cancer, joints for arthritis etcetera, before writing the date and their name. These charms can also be written for other people if you’re praying for the recovery of a relative or friend. In the early 1600s the famous wandering warrior Miyamoto Musashi came to the Ichijō-ji area and fought a series of legendary duels against members of the prominent Yoshioka-ryū school of swordsmanship. In addition to dueling, though, Musashi also underwent intense training of his own design, coming to the waterfall that is now part of Tanukidani-san Fudō-in and spending hours repeatedly striking at the water to train himself and further develop his techniques. Can you put yourself in the mind of this warrior? The path to Tanukidani-san Fudō-in is composed of 250 stone steps, and it’s a bit of a workout to get to the top. About a third of the way up you will find a large statue of a traveling monk, his legs and feet festooned with small strap-style sandal charms. Called Omukae Daishi (omukae meaning “welcoming” and daishi being “great teacher”, a title given to high-ranking monks), this statue greets visitors to the temple, and those who want to pray for the health of their legs and feet or travels hang the sandal charms on their way back down. The monk Tomoatsu Fusamasa (1687 – 1763) was famous for his construction work projects in the dangerous Hinooka Pass along the Tōkaidō Road and his strict diet of natural products like fruits and nuts, which earned him the nickname of Mokujiki Saint Yōa. He studied the Buddhist teachings of Zen, Ritsu Zen, Shingon, and Tendai when he was younger, and ascended the sacred Mt. Kōya to perfect himself and his beliefs. When he was seeking a place to retire in prayer, he began searching for an even higher peak. In 1715, word reached him of a cave in the mountains of Ichijō-ji Village north of the capital that contained a statue which shined despite many years of weathering by wind and snow. That statue was the Buddhist Wisdom King Fudō Myō'ō, once enshrined by Emperor Kanmu at the northeastern "demon gate" of the capital in order to guard against malign influence coming from that direction and moved to the cave in 1249 for worship by the local people. The area was also known as the place where famous swordsman Miyamoto Musashi came in 1604 to hone his skills and undergo ascetic training striking at a waterfall. Deciding that this place was perfect to seclude oneself and study the scriptures, Saint Yōa came to Mt. Tanukidani in 1718 when he was 31. While based on Mt. Tanukidani continuing with his philosophy of mokujiki, eating only the natural products of trees and the land without processing, was quite the difficult task. In the midst of this he also undertook a pilgrimage to Kumano, at the end of which the three gods of the Kumano shrines appeared before him as yamabushi mountain ascetics and gifted him with a sacred bell, bell hammer, and walking stick. 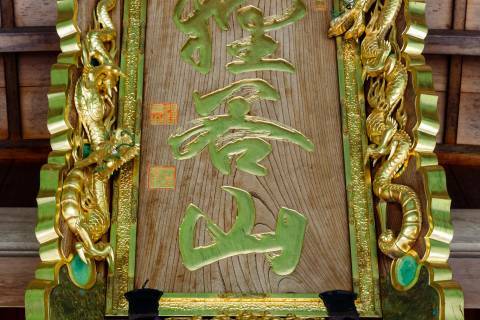 This is regarded as the birth of Shugendō traditions on Mt. Tanukidani. A practice that combines various Buddhist, Shinto, and Taoist beliefs, Shugendō can be translated as "the way to spiritual power through discipline". When he returned, Saint Yōa himself carved a 1.5-meter tall stone statue of Fudō Myō’ō based on the appearance of the original Tanuki Fudō Myō’ō statue placed by Emperor Kanmu. Though the tanuki in the name of the local valley is the word for “raccoon dog”, mythical animal tricksters in Japanese lore, in the case of this statue tanuki is spelled with the kanji for “scolding” (咤, ta) “angry” (怒, nu) “demon” (鬼, ki). As if the previous statue had been reborn, the local people’s faith was renewed, and people from all over the country seeking to participate in Shugendō ascetic practices came to Mt. Tanukidani. The cave and once flourishing enclave became neglected in the early Meiji period due to several factors, including the anti-Buddhism movement of the times. However, in the late Meiji period locals wishing to revive the Tanuki Fudō Myō’ō worship gathered and made efforts to make the mountain accessible to anyone by building stairs and clearing the forest. High Priest Ryōei, who had undergone training in Hokkaidō, was invited to serve as the founder, and Shugendō Daihonzan Ichijō-ji Tanukidani-san Fudō-in temple was officially re-established in 1944.